With Wildcard Weekend behind us, it is time to take a look at the Divisional Round matchups. The Green Bay Packers out together a dominating performance last weekend as they took down Adrian Peterson and the Minnesota Vikings. 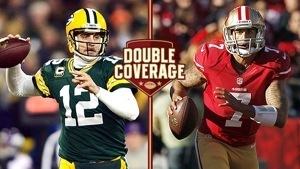 This weekend they travel to the bay to face the 11-4-1 49ers. The Niners possess one of the leagues best defenses and surely the most physical. On offense, the Niners are going to hit Green Bay with the Kaepernick option. On the outside, Michael Crabtree will look to exploits the subpar Packers secondary. For Green Bay, the key to success is of course Aaron Rodgers. They’ll lean on Rodgers to have another huge day. It won’t be clear sailing for him like it was last week. In the end I’m going with the upset, I like Aaron Rodgers to get the job done and send his team to the NFC Championship.